We can source all brands of extractors whether they are Tri-Y, Short or Long 4 into 1, Mild Steel, Stainless Steel or Ceramic coated. Talk to us about your car and driving needs and we will recommend a set to suit your needs and budget. We can supply and fit Genie, Ballistic Racing, Tiger, X-Force, Pacemaker, Wildcat, HM Headers, Hi-Tech, Hurrican, Advance, and Pro-Ex. The standard engine was 225kw for the base model car, and to get this sort of power from earlier model engines would have cost a lot of money to achieve, and over the years the engines have become even more powerful. The best thing, is the engine seems to be de-tuned to keep the power low, so improvements to the way the engine breathes, opens up the potential to make even better power gains. The Gen 3 (5.7 litre) was a very doggy engine and lacked power down low. Once the revs built up, it had plenty of power. The standard engine pipes on the VT - VY looked quite big, but they were actually a twin skinned pipe with an insulator in between, therefore the gas only travelled inside a 2” pipe, and the pipes after the cats were squashed flat to half the thickness. Fitting extractors or an exhaust system that is too big often resulted in less torque/pulling power down low, and it tended to make noise rather than power, and used a lot more fuel in the process. All modifications must be a compromise between power, noise, acceleration, and whether it is a daily driver, a ¼ mile car, or a circuit car. Unless it is a dedicated track car, then compromises need to be made. 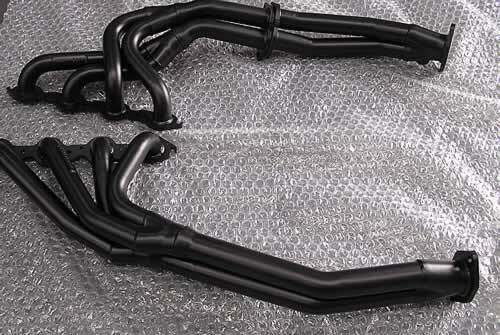 On a 5.7 litre Street Car/Daily Driver, we usually recommend tri-y extractors. The tri-y extractors make good power, good acceleration and torque down low, and they sit up much higher. If you frequent shopping centres with speed humps, or steep driveways, then tri-y’s are much better suited, especially if you intend to lower the vehicle. Long 4>1 hang low and some are below 100mm on standard suspension, so if you intend on lowering your car, they become even lower. As the 5.7 litre is doggy down low, it means you need more rpm to dump your clutch, or to get moving in an auto. This means the accelerator is being pushed harder and you will find you are using a lot more fuel. Tri-y’s have been found to get good ¼ mile numbers on stock engines, as they have far better acceleration down low and into the mid range. Yes, they will hold you back at the top of the rev range, but then again, shifting early keeps you in the maximum power band. If it is a dedicated ¼ mile car, or you are doing it for dyno numbers, the 4>1 are better. 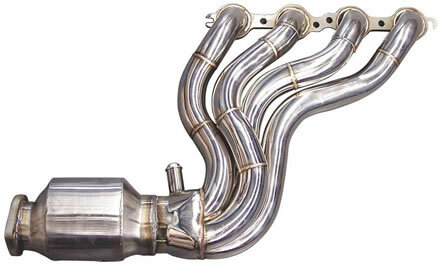 If the engine has been modified (eg Cam, or supercharger) then the 4>1 will be better for you. Changing the diff gears makes the car more exciting to drive as it increases pulling power right through the rev range in every gear. The 6.0 litre engines had much more torque and pulling power down low, so they perform better with bigger systems. This is especially true with the VE – VF models, where we have found the 4>1 in 1-7/8” work very well, and so does the dual 3” exhaust system. We redesigned our VE & VF Extractors to improve the ground clearance. We use a specifically designed 5” body Ballistic 100cpsi Racing cat which has the inlet and outlet offset to the bottom which lifts the body of the cat upwards for even greater ground clearance. This is especially helpful with speed humps, steep driveways and lowered cars. The inlet is 3.5” and after the gas passes through the substrate, it then reduces to 3” pipe size. It has been designed this way to achieve maximum flow through the cat and substrate, before it tapers down to 3”. Other brands have 4 x 1-7/8” pipe tapering down to 3” before it goes through a 4” body cat. The bigger the body of the cat, the more internal holes, therefore the better the flow. When you have 4 pipes that are nearly 2” squeezing down to a single 3” pipe, then through a 4” body cat, it isn’t really good for performance. Some of the cats others use are 200cpsi, 300cpsi or even 400cpsi.